In 2017, in response to gender-based violence in Achham, Nepal and incidents of gender-based harassment in the workplace, Subeksha Poudel created a Gender Equity Committee with other leaders in her organization, Nyaya Health Nepal. Possible is a US-based non-profit, justice-minded healthcare organization that works in partnership with Nyaya Health Nepal. Nyaya Health Nepal employs over 350 staff who care for over 150,000 patients a year in rural Nepal. It works under a public-private partnership, building on government resources to provide high quality healthcare at an affordable price. Its integrated delivery model connects community health workers and government health facilities, enabling comprehensive follow up and care of patients. As Dhatt et al. argued recently, there is substantial evidence for the impact of advancing gender equity as a core pillar of health systems strengthening . This includes the context in which we work. The majority of patients treated at Nyaya Health Nepal are women or their children; a majority of staff are women. Yet the proportion of women in leadership positions were stark when Subeksha analyzed the organisation’s leadership structure (Figure 1). Teams made up of exclusively women healthcare workers had male managers. She placed these figures in the context of statistics of gender-based violence in the community we serve: 2 deaths owing to forced isolation during menstruation (known as chaupadi) in the last year; 67 missing girls per 1000 boys; over 20% of women experiencing domestic violence. In forming the Gender Equity Committee, Subeksha posed the following thesis: “To rectify these healthcare issues and gross violation of human rights, we need women to lead the structures of power.” The goal of the Committee has thus been to put gender equity in its rightful place at the center of the organisation’s strategy and operations. Over the ensuing year, the Gender Equity Committee has shaped hiring practices based on an equitable, meritocratic system, improved Nyaya Health Nepal’s response to sexual harassment, worked to educate staff and community around menstrual discrimination, and shaped the overall dialogue of gender in the workplace. Progress has been challenging, with significant resistance within the organisation, particularly towards changing the prevailing power structures. 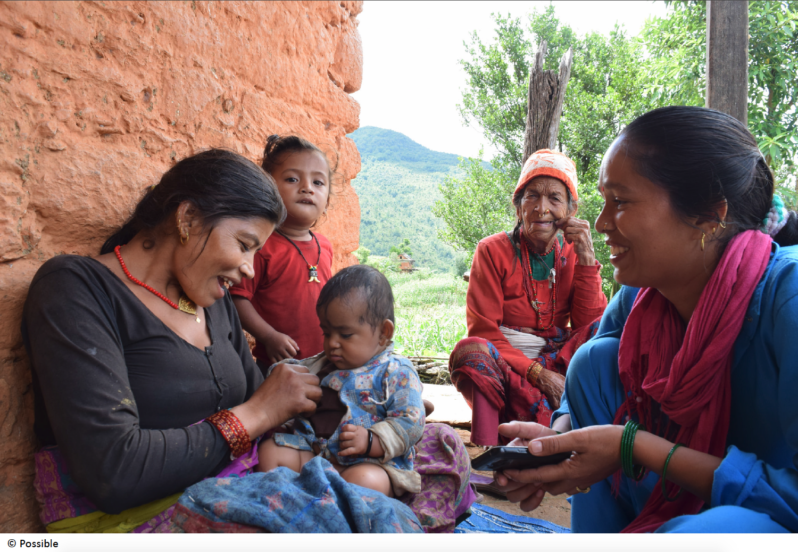 A year in, Nyaya Health Nepal has achieved substantial results through the Committee’s work. Women in leadership has increased across the structures of power (Figure 1). Gender equity is out in the open as a topic of conversation. The organization has specifically budgeted for advancing gender equity internally, and awarded a woman community health staff member a scholarship to pursue a bachelor’s in nursing. The conversation around gender has sparked additional conversations around other forms of discrimination, including caste and ethnicity. Discussions are also taking place in the wider community: one of our staff members recruited by Subeksha is a local anti-chaupadi activist, recently featured in a New York Times article for his work. Progress remains slow, both in health and beyond: in historic municipal elections conducted in Nepal around the establishment of the Gender Equity Committee, only 2% of the 753 top positions were won by women. 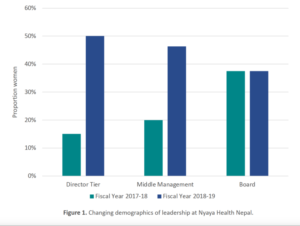 However, Nyaya Health Nepal’s experiences demonstrate the importance and positive influence of systematically and determinedly pursuing gender equity at the organizational level. There is much work to be done to fully reach gender equity in global health, but it is both attainable, and critical to achieving health for all.